The Growing Pains star suffered a heart attack and died suddenly in Los Angeles, and his son was among the first people to open his heart about his dad's passing. 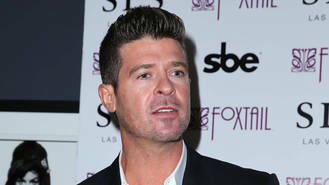 The Blurred Lines singer told the Los Angeles Times his father was "the greatest man I ever met", adding he was "always a gentleman". "I saw him a few days ago and told him how much I loved and respected him," Robin said. Alan collapsed while playing hockey with his teenage son Carter. He was taken to Providence Saint Joseph Medical Center, where he was pronounced dead. He was 69. Robin's mum, Alan's ex-wife, Gloria Loring also released a statement about Alan's death. "It is a shock," she said. "We were all just together for Thanksgiving. He was talented, funny and deeply devoted to his family. Rest In Peace, dear one." And Robin's ex-wife Paula Patton, who was married to the singer for 10 years, also took to her social media to pay tribute to the actor, sharing a quote from Mother Teresa about life. "Life is an opportunity, benefit from it. Life is beauty, admire it. Life is a dream, realise it. Life is a challenge, meet it. Life is a duty, complete it. Life is a game, play it. Life is a promise, fulfill it. Life is sorrow, overcome it. Life is a song, sing it. Life is a struggle, accept it. Life is a tragedy, confront it. Life is an adventure, dare it. Life is luck, make it. Life is too precious, do not destroy it. Life is life, fight for it," the quote read. Meanwhile, Carter Thicke posted an image of himself with his dad on Instagram and added the caption: "Today I lost my best friend and my idol, and the world lost one of it's finest. I have never known a more kind, loving, hairy, and generous person in my life and I am forever grateful for the light that this man brought to my life and so many others. "You will be missed every second of every day. You are a legend and I love you Pops. Until next time."